When looking for summertime desserts, you want something that is light and fruity. That is what make Southern Banana Pudding so great. It is easy to make, and everyone loves it! I have seen many recipes out there that call for a box of instant pudding. Don’t be afraid to make your own! It is not that hard, and you will totally appreciate the flavor that you get from it. Be sure to try out this simple, traditional Southern dessert for your next potluck. If you really want to kick up the yummy, serve it ala mode with a nice vanilla ice cream or frozen yogurt. 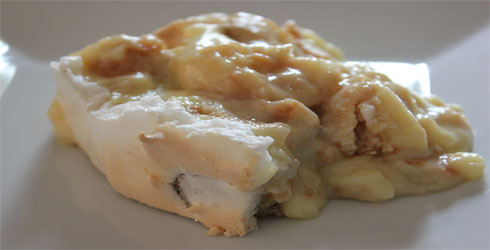 Summary: Southern Banana Pudding just might be the ultimate comfort dessert food. Simple, silky, and made from scratch. Beat egg whites at high speed with an electric mixer until foamy. Gradually add ¼ cup plus 2 tablespoons sugar, 1 tablespoon at a time, beating until stiff peaks form. Add 1 teaspoon vanilla, and beat until blended.